Posted 5th September 2017 & filed under Blog. Slowly but surely students have been turned into consumers, academics into service providers, and universities from places of autonomous intellectual enquiry into state instruments for economic growth. Creativity is thwarted by demands for efficiency; a social good has been atomised and commodified; the neoliberalisation of the British university system has changed the very nature of the education it offers. Sometimes, price tags devalue goods. In the 1960s, despite the fact that the system was funded through a centralised state agency, there was a general consensus that “teaching, research and governance of the university should be relatively autonomous from the logics of both state and economy”. This understanding was gradually undermined, first by experiments in new universities such as Warwick, where student and academic governance, typically the role of academics, was placed in the hands of administrative councils made up of “politico-industrial laypersons”. Under Thatcher, this experiment expanded to the national level; the introduction of the Research Assessment Exercise and teaching quality assessments in the 1980s and 1990s saw an institutionalised shift that mirrored the changing conception of the raison d’être of universities. What had previously been a free exercise in the pursuit of truth, meaning and value was replaced by competition for funding, based on an externally imposed framework in which value was determined in increasingly economistic metrics; research utility — understood in terms of contribution and strategic importance to the national economy — dictated the responsibilities of academics. Market rationalities seeped into every pore of university administration. A parallel trend occurred for undergraduates, who enjoyed not only free education in the 1960s but maintenance grants to provide them with cover for living costs. A pivotal moment came in 1981 when the Comprehensive Spending Review severed the link between government funding and the size of the undergraduate population, which had been established under the Robbins Report twenty years earlier. 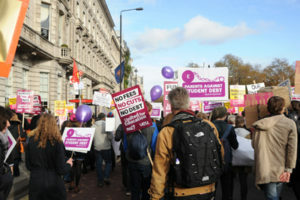 In 1990 student maintenance loans were introduced and grants gradually reduced; 1998 saw students charged tuition fees of up to £1,000 for the first time; in 2004 this figure was tripled and in 2010 it was tripled again; finally, the Summer Budget 2015 announced the removal of maintenance grants altogether. The phenomena of administrative reform and privatised student funding are two halves of the same walnut; together they have created a “binary market in higher education: one for institutions competing for research income, the other for students as consumers”. Neoliberal ideology has seen the spread of market rationality into all aspects of life, and higher education has been granted no immunity. The implications of this process for intergenerational fairness lie in the answer to the following question: does replacing social, ethical and intellectual with economic rationalities nurture or undermine the learning and personal growth of university students? For John Stuart Mill, the value of autonomous inquiry and free speech — a full-throated dialogue — is its indispensability for individual progression, for the identification of truth, and for the functioning of democratic society. By valuing, and subsequently sponsoring, research perceived to hold greater economic utility, the government is viewing the function of education through a narrowing and self-perpetuating lens. By redefining the student and the academic as consumer and service-provider, the government has caused those at universities to internalise market rationalities. Snapshots through the neoliberal lens fail to capture hidden riches in the humanities and arts; as James Vernon asserts, humanities “speak to different systems of value, different orders of pleasure and enjoyment… of imagination, beauty, laughter and wonder”. Framing the picture of university in the language of functionality changes the image itself: in treating student debts as personal-private investments, and academics as pawns to be played in pursuit of economic prosperity, the state subjectifies and stunts students; it identifies them as rational, egoistic actors, as opposed to outward-looking democratic citizens engaging in social good; it is a derogatory reductionism of the academic’s research, inappropriately quantifying the impact of ideas. The current system risks degrading the experience of today’s students, and those of the future; we must come to understand that there are some things that can’t be measured, some goods that money can’t buy.